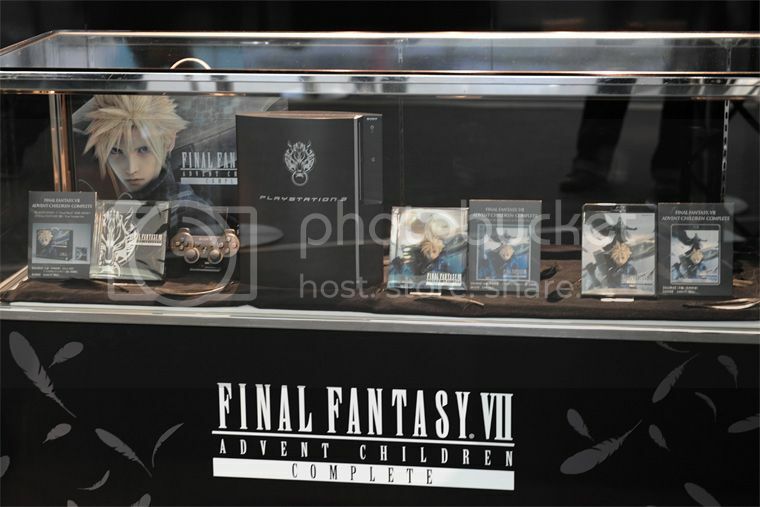 The 2008 holiday season was an exciting time for video gaming and the Blu-ray side of the interactive entertainment industry, and 2009 promises to follow suit. As consumers continue to invest in their entertainment needs this new year, the feature sets of the three multi-functional gaming systems — PLAYSTATION 3, Xbox 360 and Wii — become that much more important to consider. The Xbox 360 and Wii offer a set of features in their own right. However, when you take a look at the feature offerings side by side, there is only one true winner in delivering total value and price. 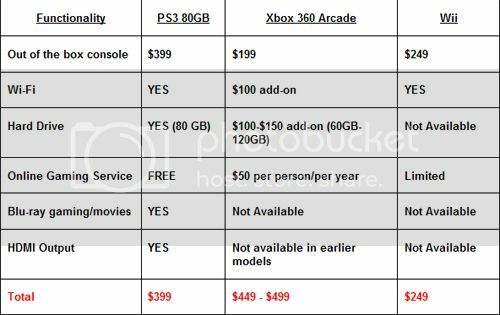 We’ve compared the lowest entry points from each manufacturer — PS3 80GB – $399, Xbox 360 Arcade – $199, Wii – $249. The PS3 is the perfect example of a product featuring superior technology and a sophisticated design creating an ideal all-in-one entertainment product. The Xbox 360 requires additional money, multiple upgrades and additional external devices, putting a burden on the wallet and adds clutter to the entertainment center. And the Wii’s lack of enhanced features comes at the expense of a comprehensive entertainment solution. So as PS3 continues to evolve without the need for additional parts or expenses, expect the competition to continue peddling add-ons in an effort to keep up with the Jones’. This is not meant in terms of numbers, or who’s got the biggest install base, or who’s selling most in any particular week or month, but I’d like to think that we continue official leadership in this industry. It’s difficult to talk about Nintendo, because we don’t look at their console as being a competitor. They’re a different world, and we operate in our world – that’s the kind of way I look at things. And with the Xbox, again, I can’t come up with one word to fit. You need a word that describes something that lacks longevity. We don’t provide the easy to program for console that developers want, because ‘easy to program for’ means that anybody will be able to take advantage of pretty much what the hardware can do, so then the question is what do you do for the rest of the nine-and-a-half years ? A [Photo Gallery] application has been added under the [Photo] category (requires additional 105MB download). Video playback of files encoded with version 3.11 of the DivX codec. Users are now able to browse the PlayStation Store without the need to create or sign into a PlayStation Network account. An error which caused saved games for some titles to become inaccessible if the user’s PlayStation Network ID or password was changed has been addressed. In an interview with the UK’s Guardian news paper, Sony’s David Reeves, reveals that the PS3’s Cellprocessor will shrink from 65 nanometre to 45 nanometre. Sony’s John Koller reveals that the company will start releasing Hybrid Movie/PS3 Game discs. Sony and Nvidia sign a deal that allows PS3 games developers to use the PhysX engine. MTV release information, sourced from official letters, that PS3 Publishers who add DLC, Demos or other content to the PS Store, must pay 16 cents on every GB downloaded. As we have stated previously, we do not have plans for a PS3 price drop, and any rumors to that effect are false and are the result of speculation, SCEA remains focused on the long-term momentum of PS3. With the industry’s best software lineup this year, combined with our most aggressive marketing campaign to date, we remain confident in our approach and the value we’re delivering with PS3. Copy-protected videos purchased from the PlayStation Store can now be backed up to an external storage device and then restored to PS3’s internal hard drive for playback. Videos purchased for the PSP can now be transferred to the PS3 for playback. A [Dynamic Normalizer] option has been added as an option under [Music Settings] in the [Settings] menu. Added [Internet Search] function to items on the [Games] menu for PlayStation 3 format software. Selecting the option launches the internet browser and performs a Google search on the item’s title. Added the ability to copy and paste text from a web page viewed in the internet browser. [Browser Security] has been added as an option to the browse mode menu of the Internet browser. The websites for the Web filtering services that used to be listed under [Bookmarks] have been moved under this new option. [Copy Address of This Page] and [Copy Address of This Link] have been added as options under [File] in the browse mode menu of the Internet browser. Ability to sort the [Friends] list via users’ online status and the time they were last online. On the [Friends] menu, new friend requests are now displayed at the top of the list. The file size limit for message attachments has been increased from 1MB to 3MB. When downloading a file, an estimate of how long the download will take is now displayed. Polish, Greek, Czech, Slovak, and Turkish text can now be displayed in the Internet browser. A [Text Chat] feature has been added that enables the user to create or join a chat room with up to 15 other PlayStation Network users and communicate using the on-screen keyboard or a compatible keyboard peripheral. This feature is available both in game and not in-game. Fixed an issue where 2-channel music files were output to multi-channel audio systems on multiple channels with the extra channels muted. It has been a wonderful ride with PlayStation. I never got to visit all 106 countries but managed 66. I have just two things to say on leaving: I want to thank all of those people who have supported SCEE and me personally in the past 14 years; you have been magnificent! A developer/hacker by the name of Dashhacker from dashhacks.com, successfully reverse engineered Remote Play, to read more about that story, visit here. I don’t think it will be next year, but in three to five years it will become dominant on the market. 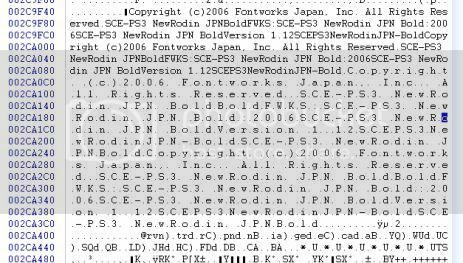 With E3 2009 coming up, rumours start, suggesting that Sony are planing to reveal a device simmilar to the “ii’s control pad. Dashhacker the creator of Open Remote Play(ORP), releases images of the GUI of the upcoming app. 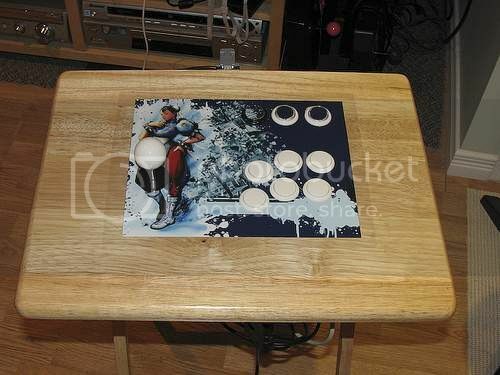 We developed brand new, absolutely incredible technology for the PlayStation 3 (PS3), but the cost was high. 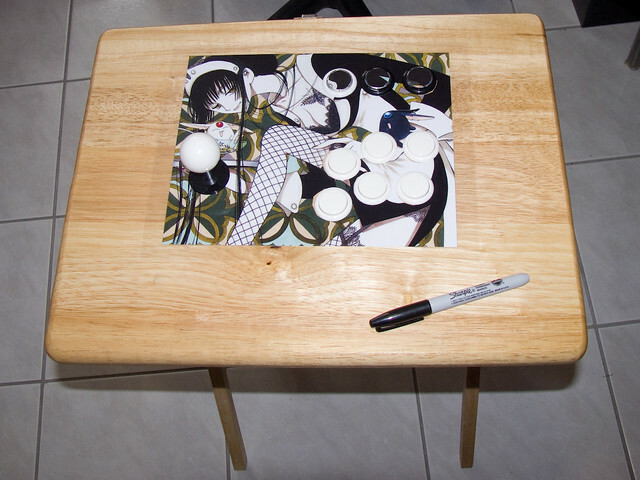 We’ve adopted a slightly different approach now, and are evolving the PS3 into a platform for web services. A lot of people thought Sony’s content download service was doomed, but it’s in a pretty good place right now in the form of the PlayStation Network, available to PS3 users for network gaming, video, etc. The DRM is based on Marlin, an open scheme developed by consumer electronics companies and other companies. What does all this mean?” he added. “Very simply, it means that Sony has begun the transition from a closed system to an open one. Next we will be expanding the PlayStation Network to hardware other than the PS3, because the number of PS3 units sold puts a limit on the scale of the network possible. Sony has a vertical structure for each product line, an organisational structure that resists change, so it will take time to achieve this network growth. However, a large number of employees share my opinion on this. After a hard drive upgrade or a restore from backup, games no longer need to be loaded before their Trophies are displayed in the [Trophies] menu. It’s expensive to develop for the console, and the Wii and the Xbox are just selling better. To boost sales, Sony has to drop prices. They have to cut the price, because if they don’t, the attach rates are likely to slow. If we are being realistic, we might have to stop supporting Sony. When we look at 2010 and 2011, we might want to consider if we support the console — and the PSP too. Message size in the [Text Chat] utility has been increased from 32 to 64 characters. Third party peripherals plugged in via USB, are now assigned to controller port 7. Closed a vulnerability which allowed the use of Open Remote Play, a homebrew application used to allow Remote Play connections to the PS3 from devices other than the PSP. Remote Play remains available for PSPs using custom firmware. Hulu starts blocking PS3 users from accessing their services. 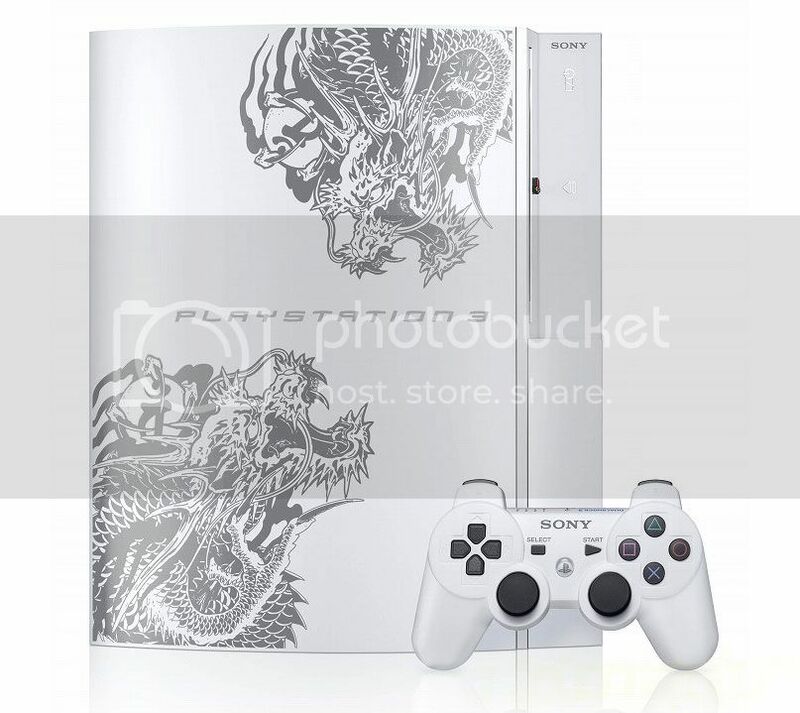 Source close to fudzilla.com state that according to documents signed by Foxconn and Pegatron, the PS3 Slim has gone into production, yet Sony stil deny these rumours. Due to an abundance of complaints from angry Wipeout HD players, Sony pull in game video ad’s from the game. * No config disc needed – it just works! * No awkward USB interface – just insert DVD and play! Famous iPhone hacker GeoHot, joined the PS3 hacking scene and promised to hack the machine, people had mixed emotions, some had great belief in him, others were sceptical, after all the PS3 was so much bigger than the iPhone, could GeoHot manage it ? Support for new Dynamic Custom Themes. [Display What’s New] added to the [Settings] menu to allow the user to change what the system displays by default on startup. [Audio Multi-Output] allows audio output through multiple connectors (e.g. HDMI and optical) simultaneously. [Audio CD Output Frequency] has been renamed [Output Frequency] and now affects all music content. Settings have subtitles for reference. Ability to check internet connection upload/download speed in [Network Settings]. Echo Canceller added to Accessory Settings. Under Remote Play Settings you can now manually set a device (such as a PSP system or Sony Ericsson Aino) to be used for remote play. Added a BBC iPlayer website shortcut for users in the UK under [TV], which now includes hardware acceleration in full-screen mode. A [PlayStation Store] icon added under the [Video] category (where PlayStation Video Store is available). Added the ability to upsample audio stored on the internal or USB hard drive to 88.2 kHz or 176.4 kHz. Background audio playback is disabled in the [Internet Browser] and [Photo Gallery] when the audio upsampling feature is enabled. During Video playback, the right analog stick can be used to play content in slow playback, fast reverse, and fast forward. A new feature added allowing game developers to display Trophies in different ways, such as grouping them by add-on pack, etc. A [PlayStation Store] icon added under the [Game] category. Platinum trophies no longer count towards the total percentage of each game. [Information Board] replaced by a [What’s New] feature. The [Friends] list has been redesigned. Messages from specific friends can be accessed from the sender’s profile screen. The ability to take screenshots has been added to the [Internet Browser]. [Remote Play] now supports mobile phones such as the Sony Ericsson Aino. When the system is started it will display the [What’s New] screen by default instead of the [Games] menu. A [Status Indicator] added to the top of the screen showing the user’s online status, the number of friends online and an icon indicating if there are unread PSN messages. The swirling activity indicator has been replaced with an analog clock (hands rotate quickly to show activity). Increased font and icon size. The default theme has been changed to an updated version of the ‘Original’ waves theme (the original theme has been renamed ‘Classic’). Support for new avatars to be downloaded. The controller battery indicator has been moved. The copy/paste functionality has been expanded. A position indicator now appears when scrolling through a large list. An issue occurred on some models, preventing the use of some unofficial controllers. XMB icons now change colour along with the theme depending on the time of day. PS3 owners who updated to official firmware 3.o, have been reporting problems such as, crashing and freezing with certain game. Chirantan Patnaik sets the world record for longest play time on GTA4 for PS3, after playing for 40 hours and 20 minutes. Improves the playback quality of some PS3 format software and fixes problems with certain games. The BBC’s Watchdog show broadcasts a show, in which it slams the Ps3’s failure rate and how terrible its repair service is. 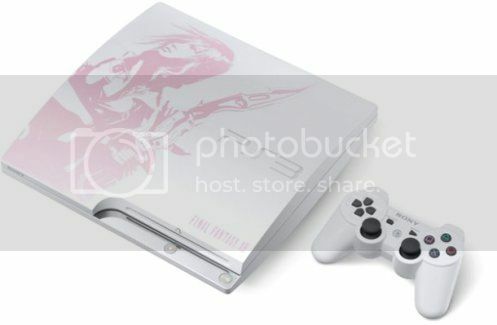 Yoshinori Kitase from Square Enix announces a FFXIII special edition Lightning PlayStation 3. 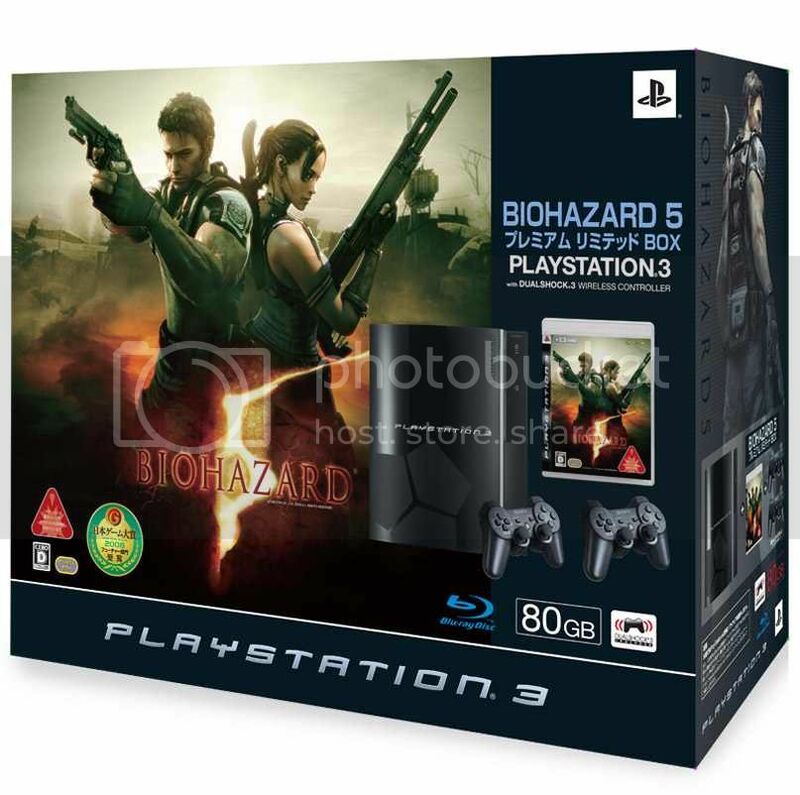 Resident Evil 5 and PS Move are showcased together. Sony announces that Netflix will be coming to the PS3. The first couple of years are all about developers getting games up and working. You see what Naughty Dog has had the chance to do in the past two years. You’ve seen what we’ve been able to do in that time. This is where it gets exciting. The PS3 still feels like a young system and I feel like it’s finally hitting its prime. You’ve got the Slim, it’s at a good price point now and sales are really picking up. Bad guys are encrypting their stuff now, so we need a methodology of hacking on that to try to break passwords, The Playstation 3, its processing component, is perfect for large-scale library attacks. Added [Facebook] menu item under [Account Management] allowing the user to change Facebook sharing and account settings. Polish (Polski) has been added under the [System Language] section. Expanded [Photo] folders and playlists are now displayed in a grid, rather than a list. Added ABC iView shortcut for users in Australia under [TV]. Added RTVE, Antena 3 and LaSexta catch-up TV website shortcuts for users in Spain under [TV]. Added NOS catch-up TV website shortcut for users in the Netherlands under [TV]. Added AXN and Animax catch-up TV website shortcuts for users in Czech, Poland, Hungary, Bulgaria, Romania and Slovakia under [TV]. Added RTÉ player for Ireland PS3 users under TV icon on XMB shortcut to website. Added PlayStation Video Store for users in UK, Ireland, France, Germany, Spain and Italy. Added Cinavia Copy protection system, a Digital Watermark added to the audio tracks of future Blu-ray. [About] now displays the new PlayStation 3 logo when choosing a game. Added the option to automatically send updates to the user’s Facebook profile when Trophies are unlocked; when items are downloaded from the PlayStation Store; or for in-game events (in compatible games). The [Friends] list boxes only appear upon highlight, however, users’ “currently playing” game and avatar box are always visible. The user is now able to change the colour of their [Profile]. Improved the performance of the Internet Browser. The user can now send system error reports to Sony Computer Entertainment in the event of an improper shutdown. Scrolling through very long lists on the XMB has been accelerated. The US Air Force, reveals that it is looking for 2200 more PS3’s to add to the 336 PS3 cluster it already has. Rumours emerge that PSP Mini’s will be playable on the PS3 before Christmas. PSP Minis can now be played via emulation. Added [Saved Data Utility (minis)] under [Game] on the XMB. Renamed the [Saved Data Utility] folder to [Saved Data Utility (PS3)]. 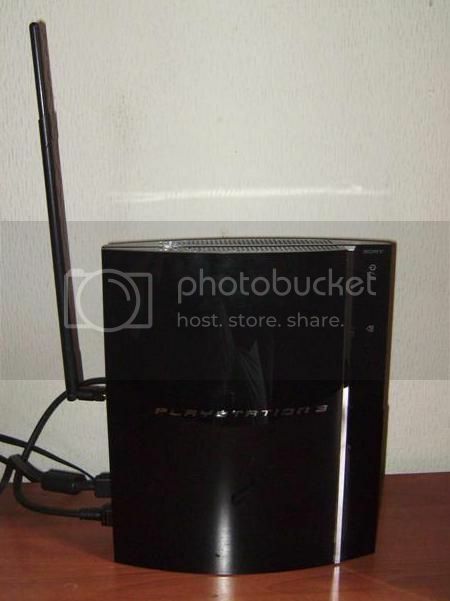 Certain data can be transferred from one PS3 to another using a LAN cable. In an interview with Nikkei, SCEJ’s Masayuki Chatani reveals that the company had planned to make the PS3 Slim smaller and that they also considered Flash Storage and Network Storage, but opted for HDD because it was cheaper. The Cell processor has an SPI port which is used to configure the chip on startup. It also allows hypervisor level MMIO registers to be accessed. In the PS3, the south bridge sets up the cell, and the traces connecting them are on the bottom layer of the board. Cut them and stick an FPGA between. Quick theoretical attack. Set an SPU’s user memory region to overlap with the current HTAB. Change the HTAB to allow read/write to the hypervisor! If that works it’s full compromise of the PPU. I spent three weeks in Boston working software only, but now I’m home and have hardware. either through software or hardware (with a mod chip). The PS3 is a prime example of how security should be done, very open docs wise, and the thing even runs Linux. 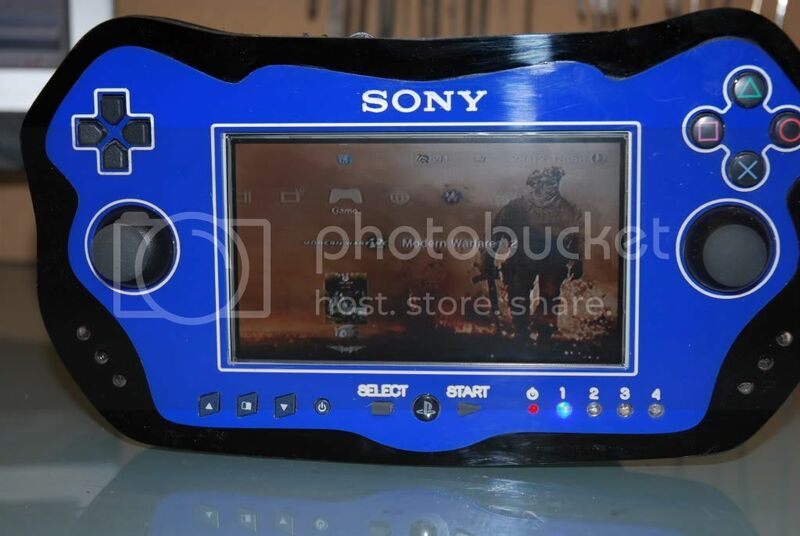 Hardware Modder techknott showcase his Wireless Visual Interface for the PS3.